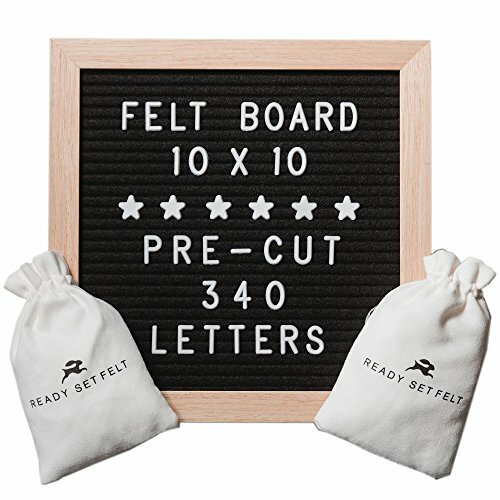 This Ready Set Felt Letterboard is ready for you to use straight out of the box. All letters and emojis have been pre-cut for you which means NO snipping, NO pulling, NO scissors and most importantly, NO time wasted. Whether you use our letter board to add a festive message to your holiday, leave heartfelt reminders for your family or teach your kid how to spell, you can do so immediately on our high-quality letterboards. Why our letterboards are better? We pride ourselves on creating products that leave our customers 100% satisfied. If you don’t love your Ready Set Felt Letterboard, we will buy it back. No questions asked! Please do not wait as stock is currently limited. Add this Felt Letter board to your cart now! ✅ PRE-CUT LETTERS SAVES YOU TIME - Don't waste hours pulling and snipping letters off the mold. We did the dirty work so you can craft your message immediately. ✅ QUALITY YOU CAN TRUST - Our solid oak frame letterboards are designed for long-term durability while the robust felt ensures your message displays boldly for all to see. ✅ CREATE ENDLESS MESSAGES AND MEMORIES - Impress your friends with #Instagram-worthy messages that are inspirational, funny or romantic. Great way to spice up your baby photos, holiday decorations and birthday parties for years to come. ✅ LETTERS DO NOT FALL OFF - Letters stay secure on our letterboard even when dropped, knocked or tilted. ✅ LIFETIME WARRANTY - If you don't love our letterboards, we will buy it back. No questions asked! Click ADD TO CART and order your Letter Board today Risk-Free! If you have any questions about this product by Ready Set Felt, contact us by completing and submitting the form below. If you are looking for a specif part number, please include it with your message.